Montana Wildlife Services recently held its third in a successful series of workshops highlighting the importance and effectiveness of using nonlethal proactive measures to protect livestock from wolves, bears, and other predators. 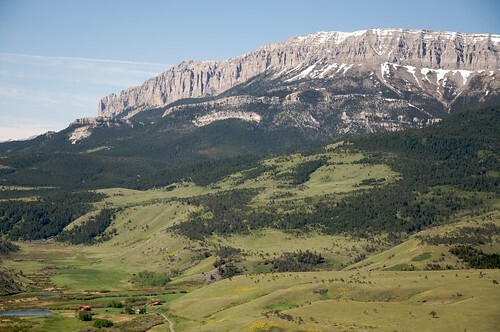 The workshop, held in Conrad, Montana, was co-hosted by the Marias River Livestock Association and Montana State University Extension Service. Like the previous two, this conference featured another impressive lineup of speakers, including agency officials, ranchers, and conservation representatives. They all shared compelling examples of effective nonlethal strategies to deter predators, including livestock carcass removal projects (the massive Waterton Biosphere Reserve program covers 1.2 million acres); cost-share programs for electric fencing and bear-proof garbage cans and grain bins; and reliable guard dogs that are friendly around people and effective against predators. Wildlife Services Resource Management Specialist Michael Marlow also emphasized the effectiveness of simple human presence as a deterrent. By analogy, he described the great effort he makes to eliminate his own scent while hunting, even waiting to change into his hunting gear until he is out in the field, yet still noticing coyotes picking up on his scent and immediately fleeing. He pointed out that simply spending time with one's livestock, and leaving behind a human scent, can scare off predators and help reduce the risk of predation. But perhaps the most resounding message was one that was never explicitly discussed. Over the course of the day, it became increasingly clear that there is an immediate need for Wildlife Services--in Montana and beyond--to provide actual, on-the-ground assistance to livestock producers to help implement the many tools we spent the day discussing. Interest in these measures is growing, but ranchers, apiarists, backyard chicken owners, and others may lack the experience, time, technical know-how, or financial resources to actually acquire, install, or use them. Where do I get a guard dog and how do I train and care for him? Where do I buy fladry and what is the best way to install it? I've never put up a 6-wire electric fence - can someone help me out? In these circumstances, Wildlife Services is ideally situated to help bridge the divide between concept and application. Historically, however, it has rarely done so. One of many tools available to livestock producers, electrified--or "turbo"--fladry can effectively deter wolves and other predators. This presents a perfect--and badly needed--opportunity for Wildlife Services to help usher in a new era of coexistence between people and wildlife. The agency rightly points out that it publishes information about living with wildlife, that its National Wildlife Research Center studies and develops nonlethal ways of reducing conflicts with wildlife, and that--led by Montana Wildlife Services--it has recently begun to hold educational workshops across the country focused on nonlethal measures to reduce livestock depredations (in the last year, in addition to Montana, such conferences have been held in Oregon, Minnesota, Oklahoma, Wisconsin, Idaho, and Texas, and more are planned for California, North/South Dakota, Utah, Nevada, and Washington). Yet, when it comes to actually addressing livestock-predator conflicts on the ground, the agency has historically used lethal control the vast majority of the time. Wildlife Services spends millions of dollars each year investigating reports of livestock losses; operating helicopters, planes, and other vehicles; and using traps, snares, poisons, firearms, and ammunition to kill predators--all in response to conflicts after they have occurred. But it rarely invests such resources in proactive measures to prevent conflicts from happening in the first place. Indeed, as the recent audit report by the USDA Office of Inspector General noted, the agency's position has long been that implementing nonlethal measures is not its responsibility, and that such tools "are more appropriately applied by the resource owner"--i.e., ranchers--than by Wildlife Services. But there is no reason why this should be the case. The federal law governing the agency's activities authorizes the agency to "take any action"--lethal or nonlethal--"in conducting the program." There is nothing preventing Wildlife Services from investing in and prioritizing nonlethal prevention measures, while reserving lethal control as a last resort. Just as importantly, there is nothing preventing livestock owners, counties, state and federal agencies, or other "cooperators" (entities or individuals who contract with Wildlife Services for predator control services) from requesting--or requiring--that the agency prioritize prevention. In fact, if the agency were to invest more in assisting the public with proactive measures, it may ultimately be able to save time and money, prevent more conflicts, and keep many more animals--both wild and domestic--alive. We appreciate and applaud the time, effort, and resources Wildlife Services has recently invested in research, education, and public outreach regarding the use of nonlethal tools. Now, with interest in these measures growing, it is the perfect time--and more critical than ever--for the agency to seize this opportunity and provide the public with actual, hands-on assistance with acquiring, installing, and correctly using these measures--and making sure they have a chance to work.